WOMELSDORF, Pa. — Demolition of the towering smokestack of a 92-year-old boot factory in Womeldorf began Tuesday morning. 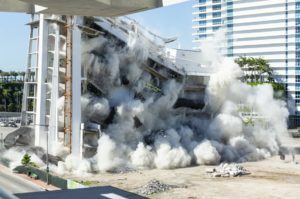 The towering 92-year-old structure was crumbling for years, but fallen bricks last month sparked concerns it might topple, officials say. On Jan. 23 a maintenance worker at the complex found bricks that had fallen off the top of the 130-foot structure in the 300 block of West Franklin Street. A home across West Franklin Street was evacuated because of fears the smokestack might tumble, said Jeff Fiant, the borough’s building code official. The occupants of the home are staying with relatives until the situation is remedied, Fiant said. 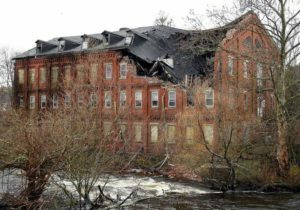 The building owner, Omega Property Management LLC, hired Empire Service Inc., a Reading-based demolition firm, to remove the smokestack. The project is expected to take about a week. Barriers have been placed to block traffic from entering the block. The smokestack is part of the factory complex built in 1926 and formerly served as a finishing plant for Blair County-based Double H Boots. It now houses four commercial tenants, including a coffin supplier to area funeral homes.